"It's a bad storm, folks. Yes, indeed, up to two feet inland and a foot along the coast. Expect more snow this afternoon." It's snowing like crazy in Far Hills and school is cancelled. But wasn't that what Madison wished for? 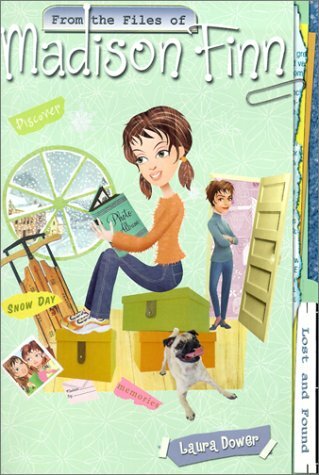 Madison finds herself stuck indoors with her Mom and her pug, Phin. But who knows what Madison will find snooping in the messy attic, in the old boxes filled with old letters and photo albums. She learns secrets about her Mom and herself. Memories she had long forgotten. Is she ready to accept the fact that her now worst enemy, Ivy Daly, used to be her BFF once? What actually separated them? Madison Finn book series is really an interesting and easy read and will probably of your school days. This series is great for children. Madison is a 7th-grade girl with divorced parents. The series is about Madison's life and how she copes with her family, friends, enemies, and of course, boys. The fun thing is that Madison loves to write about her life in files on her laptop (sort of a diary). This series sounds very good! I'm going to try to check it out! thanks for bringing it up! I read this book last year, got it from my younger sister, and fell in love with the series. It's not for people of my age though.